Northwest Harris County Municipal Utility District #28 serves Normandy Forest Subdivision and Klein Collins High School, Schindewolf Intermeditate and Kreinhop Elementary Campuses. It is managed by a Board of Directors who are all residents of Normandy Forest and provide their skills and experience as community service to their neighbors and friends. The District represents government in our small portion of Spring, Texas. We strive to live up to the purest ideals of our Country as government of the people, for the people, and by the people. Please see attached order cancelling election and declaring unopposed candidates elected to office. The contract for the perimeter wall for Normandy Forest has been awarded to Aber Fence of Tomball Texas. The total cost reflected in the accepted bid is within the financial limits established at the 2015 Town Hall Meeting. This means the wall is financed using the debt service savings from refinancing our 2004 debt to pay for the new bond sale obligations, and that the costs are below the $1.25M dollar estimate detailed in that meeting. Construction is slated to begin this Spring and conclude in approximately 9 months, weather permitting. At these meeting, we hope to answer your questions, give a general idea of what is planned, review construction preparation of the affected properties, and review the easement obligations. We will try to limit discussion about individual properties and any special circumstance related to them. Instead, we will address these concerns in individual meetings during the two weeks following each group resident meeting. 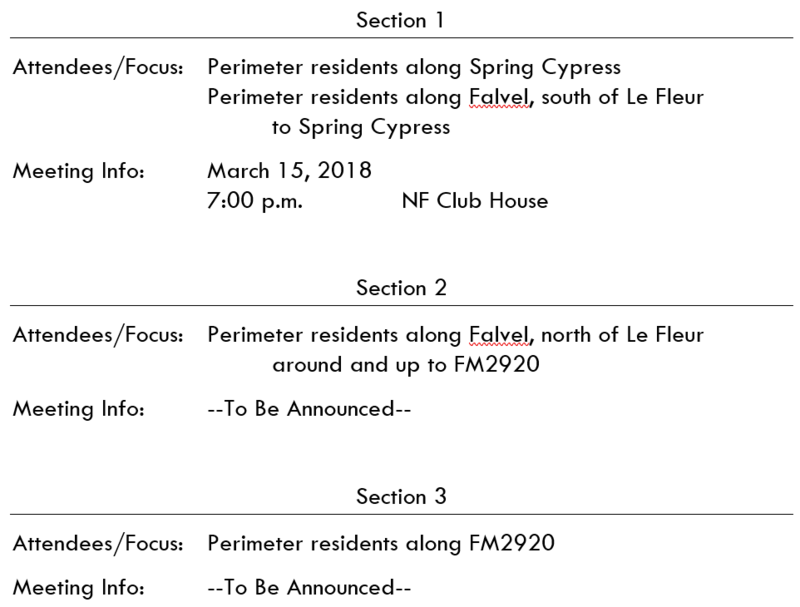 Forms will be issued at each meeting to allow perimeter residents to document concerns specific to their property. We are going to do everything we can to minimize disruptions and inconvenience during the installation process. Please give us your patience and support.